Consultant salary and pay information is in hot demand, for everyone from solo consultants to people working at big firms. And it’s hard to find because consultants’ salaries or fees depend on a number of variables. 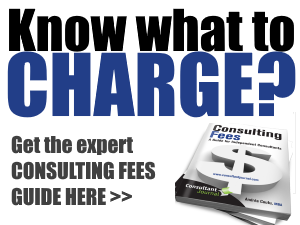 Full-time consultants may collect a steady salary, whereas independents typically charge fees. Navigating the factors behind pay differences can be challenging, so we’ve put together this handy “Consultant salary & pay 101” summary. Consultants may work in a dedicated role for a firm, or they may also be known as contractors, independent contractors and freelancers. They get paid to provide services – including advice and information – to their clients. 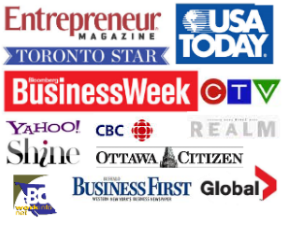 Some have business clients and others serve the public. Consulting salaries are all over the map. 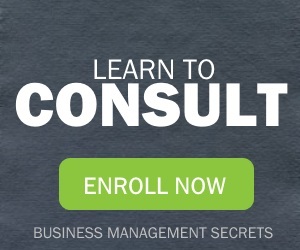 According to Salary Wizard, a business process consultant typically earns $98,644 a year. An education consultant’s rate is $89,677. An information services consultant makes $92,281. A leasing consultant, in comparison, earns $26,807. As you can see, it doesn’t really help to just look at a job title, when it comes to a consultant’s salary. You need to know what work they’re doing, where and for whom. >> More on working out what to charge as an independent. Big firms including Accenture, PriceWaterhouseCoopers, McKinsey and Bain. These mega consulting firms usually focus on work for Fortune 500 companies. If you work here, you’ll have the benefit of training programs, clear career paths and well defined methodologies and process. However, you may also find yourself working long hours and dealing with politics, red tape and the bureaucracy of a large organization. These firms tend to charge clients high fees, since clients feel secure in buying from a brand name. Boutique consulting firms – the word “boutique” refers to niche focus, not a retail shop – firms specialize in industries or business problems. For example, a firm might specialize in financial services, product launch, the tech industry or HR audits. If you work here, you’ll have more opportunities to work directly with clients and senior consultants. You’ll be able to gain focus in an area. However, you may find that you’re operating in a silo, with little exposure to firms outside that area of focus. You may also not enjoy working in an environment with less clarity in approaches and processes. These firms tend to charge lower fees, although sometimes their expertise is in such demand that they can charge more than the big firms. Sometimes, their client situation is a bit shaky, depending on the size and history of the boutique. Consulting arms of mid- to large-sized companies. Many product and service companies have consulting wings. And they range from big names, such as IBM or Microsoft, to mid-sized firms with complicated business solutions. These firms also tend to have clear training programs, methodologies and career paths. However, you get all the political and bureaucratic headaches of the big consulting firms, along with pressure to push your employer’s solution on the client, since they need to get their product or services sold. 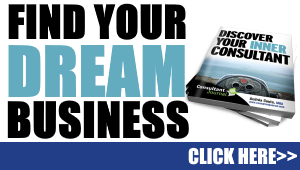 As a hired gun, solopeneur or independent consultant, you’re on your own. You call the shots – and remain accountable for them. You reap the rewards – and the consequences – of your own work. You can specialize in areas that align with your interests, experiences and talents. You work directly with clients, take all the profits and can learn all you want. On the other hand, you’ll need to do it all yourself. You’ll take charge of admin, marketing, sales, customer service, product/service development and delivery and much more. It can help to have a good overview of running a business, along with a good business plan. Consultant salary ranges depend on many variables. That’s because each consultant brings a unique blend of skills and experiences and rates will depend on demand for their services, along with the client’s willingness to pay. For many consultants, working out what to charge can be bewildering. However, if you get a good sense of compensation models, you’ll feel more confident, in control and better able to focus on your clients’ needs. You’ll also be better able to navigate sticky situations and deal with finicky clients. Having good business and marketing plans in place can help too. If you’re certain about your business model, your clients and the work you provide, you’ll be in a better position to determine your rate of pay.